There's something irresistible about a hand pie — is it because you get the whole pie to yourself? Of course they're delicious warm out of the oven with vanilla ice cream, but if you pack them (room temperature) for a picnic, you'll be the rock star of the party. Make the dough: In a small bowl, whisk together the sour cream, lemon juice, and 3 tablespoons of ice water; set aside. In a medium bowl, mix together the salt, sugar, and flour. Add the butter cubes, then with your fingers or a pastry cutter, break the butter up until it resembles coarse meal with some pea-sized bits mixed throughout. Stir in the liquid, just until combined. Gather a clump of dough in your hand to to see if it holds together; if it's too crumbly, add a bit more water (1 tablespoon at a time). Divide the dough in half, then press it into two rectangles. Wrap each rectangle in plastic wrap and chill in the refrigerator until firm, about 45 minutes. Make the filling: In a medium bowl, mix together the blueberries, lemon zest and juice, sugar, cornstarch, and salt. Assemble the hand pies: On a lightly floured surface, roll out each rectangle of dough into a larger rectangle, 7 inches by 14 inches. Cut each rectangle in half, into squares, and then cut once more, into strips. Brush the edges of each strip with water. 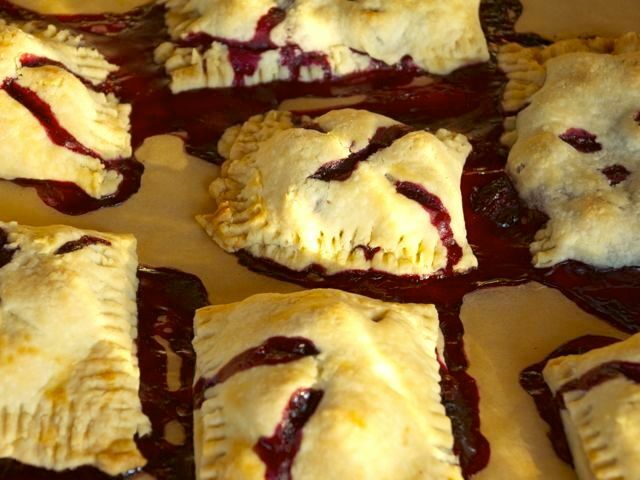 Spoon 2 tablespoons of blueberry filling onto half of each strip, then fold the other half of dough over the filling. Press the edges down firmly, then set the pies on a baking tray lined with parchment paper or a silicone baking mat. Use a fork to crimp the edges of each hand pie. Repeat with the remaining dough strips and filling until you have a total of 8 hand pies. Cut vents in the top of each pie. Transfer the baking sheet to the freezer and chill until firm, about 30 to 45 minutes. Bake the hand pies: Preheat the oven to 375 degrees. Bake the pies for 35 to 45 minutes, until golden brown. Cool on a wire rack. Serve warm with vanilla ice cream or at room temperature.